Before September 25, 2017, the Mandalay Bay Resort and Casino was just another hotel on the Las Vegas strip, and hotel security wasn’t a major topic on TV news or the front pages of major newspapers. But after the worst mass shooting in modern US history, that all changed. Now, hotels nationwide —including many here in Philadelphia, PA — are rethinking their approach to hotel security. As you might expect, there’s been pushback. Some hotel owners and managers are wondering if a single, seemingly isolated, lone wolf attack should mean rethinking their approach to hotel security. At Signal 88 of Greater Philadelphia, we believe the answer is clear. Hotels need to be mindful of patrons’ security concerns, and they need to be prepared for worst-case security scenarios. What’s more, local hotels should seize this moment to re-evaluate security systems that have fallen behind modern threats to hotels and their guests. Anyone who works in hospitality knows that a successful hotel depends on a great hotel experience. Your success depends on the way people perceive your hotel and how your guests feel before, during, and after their stay. So if your guests feel unsafe — no matter how poorly founded their safety concerns may be — that’s something you need to fix. Projecting an image of security and safety sometimes means taking above-and-beyond measures. But after an event like the one in Las Vegas, increased hotel security in isn’t just for show. Hotel owners and managers, especially those in urban centers like Philadelphia, need to be mindful of how coverage of security events increase criminal awareness about security vulnerabilities. Of course, hotel security in Philadelphia and beyond goes past worst-case scenarios. Today, the hospitality industry remains vulnerable to physical theft, data breaches, criminal misuse of accommodations, and a range of other security concerns. Evolving technologies have made criminals more sophisticated and dangerous than ever. But security systems in some hotels, including many here in Philadelphia, are stuck in the past. With all the focus paid to hotel security in recent months, many hotels are discovering massive vulnerabilities in IT systems, physical security, and workforce practices. So while many hotels are performing security assessments for worst-case threats, the true value of these assessments often lie in other areas. Looking for a smarter solution to your hotel’s security needs? Signal 88 of Greater Philadelphia can help. Our services are built on customized solutions, expert assessments, and advanced technologies, like our 88 Edge® system. We offer a more modern, more effective, and more affordable approach to hotel security in Philadelphia and the surrounding areas, including Bensalem, King of Prussia, Fort Washington, Norristown, PA. 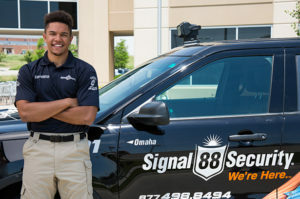 Call (610) 489-1890 today for a hotel security consultation from Signal 88 of Greater Philadelphia.